Way to go Denny! Best place to start is from the front row–not too shabby rookie! See ya at the Bud Shootout in 2007! 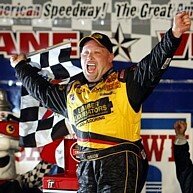 Congrats to Todd Bodine! I saw the last part of the race. It looked like Mike Skinner was going to win, but those announcers jinked yet another driver. They said Skinner had not won at Texas and when he was close something would happen. Yep…that’s exactly what happened…yellow came out late and the race went to a green/white checker. 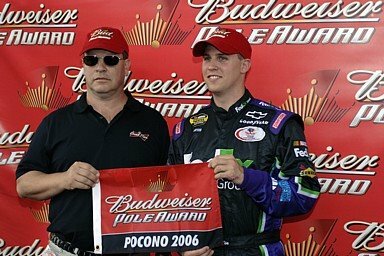 This meant Todd Bodine was able to close up on Skinner, pass him, and go on to win. Have to give Todd his props. He was lapped, got the lucky dog, and came back to win. Non-Nascar report from Texas: Congrats to Helio Castroneves for winning the Bombardier Learjet 500 at TMS. Best highlight during practice…Justin Labonte crashing Little Shrub’s primary car..(as Trixie stands up on the pitbox and does the happy dance) and he struggled ALL night long…and several laps down. It was nice to have the Busch race be DW free! Thanks Hermie for making listening to the announcers a pleasant experience. 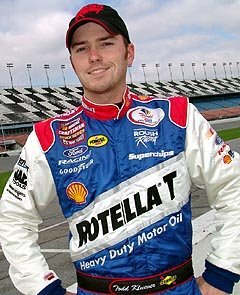 Best name for a driver…Cale Gale. Congrats to Flipper! Clint, Kevin, and Denny gave him a good run, but it just wasn’t enough. Cale Gale… that name cracks me up.